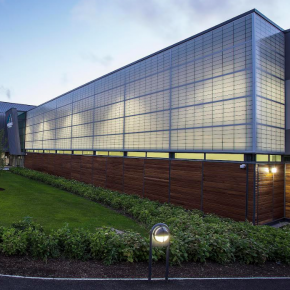 Designed and specified by architects Samuel Stevenson & Sons, this centre of excellence comprises part of the North-West Regional Sports Campus. The Kalwall is a vital part of the £12.7m re-development with double indoor swimming pool coupled with new facilities for Judo, Wrestling and Mountaineering. In the daytime, the Kalwall enhances daylight and distributes it internally without shadows and glare, while at night, it creates a welcoming glow with scallop-shaped backlighting. The unique ability to transmit large amounts of usable light with relatively low levels of solar heat gain means less radiant energy transmitted and this, together with diffusion, eliminates hot spots and glare. With increased natural daylight and resistance to solar gain, energy-consuming artificial lighting and air-conditioning costs are dramatically reduced. Kalwall is highly resistant to impact, meaning it is outstanding for use in schools, leisure facilities, gymnasia, offices and other public buildings. It is particularly popular for use in swimming pools, as glare on the surface is a concern, with dazzling rippled sunlight bouncing off the surface which can be of discomfort to swimmers. Furthermore, it can be a serious safety issue, as lifeguards can struggle to see swimmers should they need of assistance. It is also popular in sports halls, as it is important there is an even distribution of light so that players can distinguish markings on the floor, as well as easily spotting balls and other obstacles. Kalwall is a popular choice for projects where performance, long life cycle and low maintenance are sought, coupled with an aesthetic finish. The lightweight system reduces the need for supporting structures while offering the highest protection in terms of wind-borne debris and resistance to impact, abrasion and point loads.